Sant Gyaneshwar was the saint of india.he Becaame in long time ago.Gyaneshwar was born in the year 1271 in a small village near the Godavari River. His father, Vithalpant, found married life annoying and deserted his wife to seek refuge in the holy city of Benaras. However, the Guru who had initiated him came to know about his wife and sent him back to his village. Later, four children were born to them. The first was Nvrittinath, then Gyaneshwar (in 1271), another boy Sopana and a daughter Muktabai. He became in Maharastra.He dint want to get married and wanted to be a bramachari all his life. 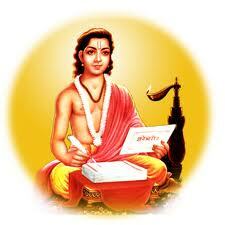 He would always meditate upon god and read the holy book of Srimad Bhagavadam. He would get alms and have his food. He once came to Pandharpur and had the darshan of Lord Vitthal and was sleeping on the banks of river Chandrabhaga. That night Lord Pandurang came in his dream and said that a Brahman would bring to him a girl called Rukmani tomorrow and asked him to get married to her. He got up in the morning and started performing his daily ritual thinking why god had asked him to get married when he wanted to be a bramachari all his life. Pandurang had also told the same to the Brahman in his dream and had asked him to go in search of Vitthobha on the banks of Chandrabhaga the next morning. The Brahman came to Chandrabhaga and on seeing Vitthobha told him about his dream; Vitthobha told him that Pandharinath had also told him the same and agreed to get married to his daughter. He then came back to his village and started living as a family man. Vitthobha was longing for a child so that he could go back to sanyasa ashram leaving his wife with the children, but unfortunately they did not have a child for a long time. One day Vitthobha left home without telling his wife and went to Kasi and met Swami Ramanada. He then formally took Sanyasa ashram from his guru Ramanda and stayed with him in Kasi. His wife Rukmani was searching for him and months passed by. Some one had told her that her husband would return if she goes around the Pipal tree . She started doing this religiously and years passed by but her husband had not returned. Gyaneshwari is the interpretation of the Sacred Bhagvad Gita, while Amritanumbhava is the outpouring of his devotion to god as well as the great saints. Today, Gyaneshwar is regarded as one of the greatest as well as the most difficult philosophers minds of India.